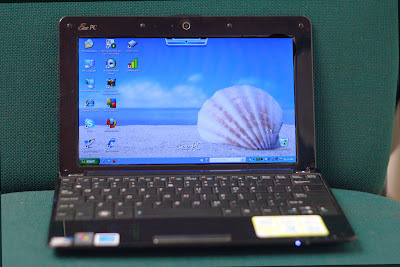 Are you tired of the "NetBook's" That will not run your applications due to the screen resolution of 1024X600??? With the Asus they fixed that you can run 1024X768 on this 10.1" Wide Screen this rocks... With a utility that will allow you to set the resolution to 1024X768 and then compress it so it fits on the screen (looks a bit squished but useable) with out panning. Wireless 802.11N will work with b and g networks as well. So there is not much different across the entire class of NetBook's out there. 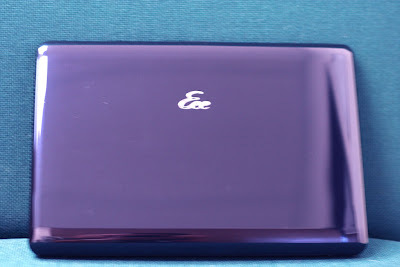 Also if you are looking to load OS X (hackintosh) on this little Eee PC you would probably be better off looking for a different NetBook according to BoingBoing folks that do this a lot there are quite a few incompatibilities. Here is a shot of the top case ... the 1005HAB is actualy a Royal Blue color. Most cameras and pictures show it more of a black but this is a shiny blue and really looks great. The biggest issue I had with the keyboard on the 1005HAB was it felt cheap. Typing on it did not feel as it would stand up to the test of time. IMO Asus could have put more energy in to the keyboard.. the HP Mini 1000 keyboard feels much better and more sturdy with the key clicks. This one just felt like a toy.. The touch pad has raised bumps on it (like braille) I really was not very happy with the touch pad so much the surface seemed to catch my fingers. I live in a very dry climate so moisture was not involved here .. for some reason my fingers would not glide properly across the touch pad. The Mouse button (a mouse Bar IMO) there are not 2 buttons just the bar it still performs right and left click and I did not have any problems using it ... but I wonder if it will wear out prematurely due to not having a physical separation of right and left??? Lack of BlueTooth really chaps my *&^ though ... I realize I may be a very small percentage of the population that use BlueTooth for what I do ... but if I am going to use any laptop that has multi-media capeablities (Hulu, iTunes, movies,....) I want to use WireLess Head phones ... and as much as I don't like the fit and feel of my Motorola S9 head phones, I use them quite often. 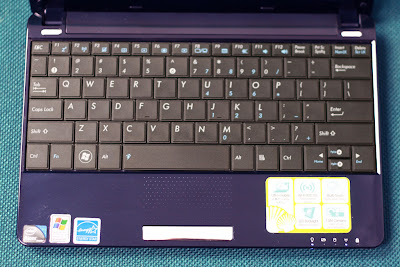 Overall Asus has produced a usable neat little NetBook for the casual user. Performance was better than other Netbook's I have been able to use. With the included Super Hybrid utility. Hulu Standard Resolution full screen was smooth and watchable. 480p could be watched not in full screen with very little lag. The capeability of displaying 1024X768 on the native 1024X600 with out panning ... is cool and worked for my applications and attaching to Terminal Server services and Citrix applications that require a minimum of 1024X768. Keyboard leaves a lot to be desired very cheap feel and does not seem like it will stand up to rigorous use. If it bothers you .... this goes for most of the NetBook's I have used ... finger prints... they will be every where touch pad, exterior case, and the display panel. The Glossy finish on these will pick up every thing ... keep cleaning cloths close by if you are the least bit bothered by smudges. well, i've had it for a while and the keyboard definitely stands up well. The bumps on the touch pad wear down though. I am very glad to hear the Keyboard will stand the test of time.. when the bumps on the touch pad wear down.. does it make it easier to use? That was one thing that really bothered me with this netbook .. I just could not get use to mousing around with it. Very late reply but I've used this netbook for about a year and a half now. Bought it used as well. The keyboard has held up well and as far as the mousepad goes, I think it feels good. Definitely can't use it if your finger is damp or anything. My hands are generally soft, and I live in Arizona, but the mousepad tracks well for me, and I have the sensitivity relatively high. The bumps have worn down in the middle but are still present as you go to the edges. They're presence really didn't help much except to let you know that you're touching the mousepad, rather than the trim, because honestly they both feel exactly the same.